The World Cup has been a great ride so far. I’ve had lots of fun watching the games with more Brazilians than I knew lived here in the Bay Area, and with live Brazilian music and all. What a joy! What do you think will be the score for Brazil vs. Netherlands? Post your bet on our Facebook community. 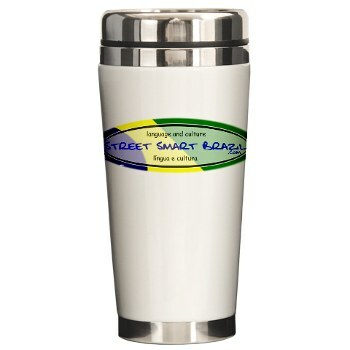 The first post with the right score will get a Street Smart Brazil Travel Mug. Guess the right score not including a decision by penalty kicks. If the game is a tie in the first 90 minutes, the right score will be the final score after the 30 minutes extra time and before penalty kicks. Come on, play with us and invite your friends to bet, too! To go to our Facebook community, click here.